Our little town of Brookville, Indiana has a population of 2500 people. It is a quiet little town. Kinda like Mayberry. I’d love living in Mayberry. I miss Andy 🙁 Here in our little town over 1 percent of the population plays pickleball. So when something special happens in our little town and it has anything to do with pickleball, people get excited. Well, excitement drove into town last night. Lynn and Linda Laymon stopped in to play. 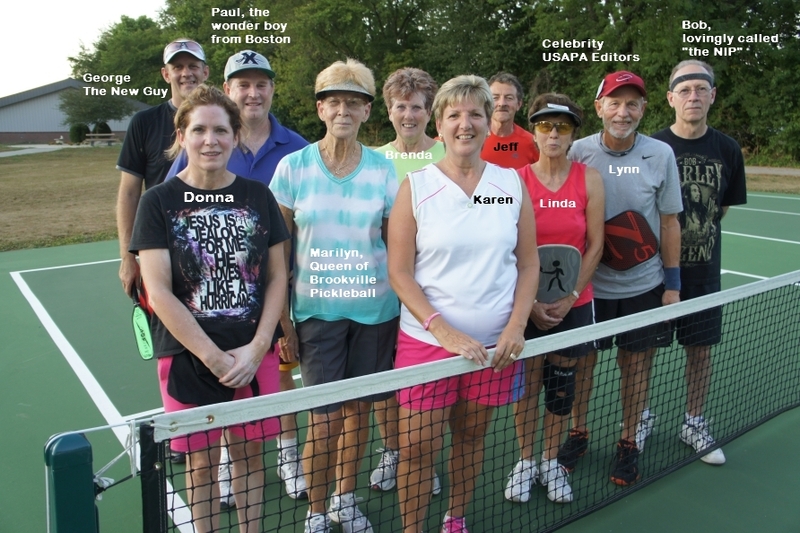 Lynn and Linda are full time RV’ers, but more importantly to us pickleball players, they are also the editors of the United States Pickleball Association’s monthly newsletter. That’s pretty much the equivalent of rock stars here in our town. Karen and I met these two at a pickleball tournament a few years back and became almost instant friends. It’s always good to see Lynn and Linda since they always have a boat load of pickleball stories to tell. Just so happens they were passing through Indiana on their way to visit Lynn’s parents. We received an email from them asking if there was any pickleball going on Monday nights. I knew there wasn’t but I lied. Actually only a partial lie because I now intended for this Monday night to be a pickleball night in Brookville. “Sure, stop on in for supper Monday night”, I said. “There will be plenty of players there around 7.” I hoped. Nice thing about living in Mayberry. You can almost walk out your door and yell down the street and people will answer. In this case I put out the bat signal with a couple of quick phone calls and a few text messages. Thanks for stopping in Lynn and Linda!!!! Submitted by Shawn Morton, Phys Ed Teacher, Upper St. Clair High School, Pennsylvania. Reprinted with permission. 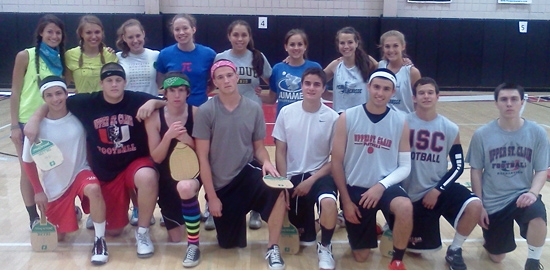 Here at Upper St. Clair High School students have a pickleball unit each year in their PE classes and are ranked for motivation. 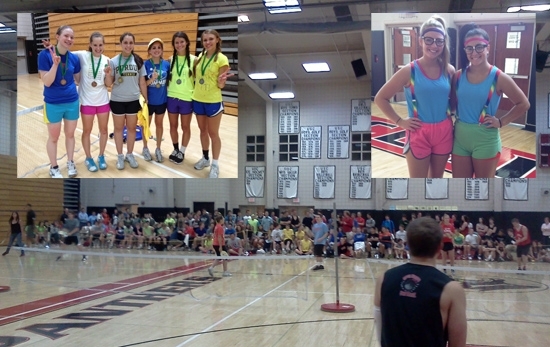 Four years ago we decided to run a pickleball tournament that included the entire high school. We also wanted to raise money for worthy causes. We held the tournament right after finals because it would be the last day the seniors were in school and classes would not be interrupted. We decided to raise money for a program called kids helping kids where students from our school travel to the Dominican Republic and to volunteer. Projects include building aqueducts and installing water purification systems to bring water to remote villages where each family has to take buckets down to a river. Past projects included building additions to preschool centers and providing concrete floors to families that live on dirt. Medical and dental supplies are also provided each year. What started as an afternoon tournament has grown into a two-day in-school field trip. The first day 160 students participated in mixed doubles. The following day boys’ doubles and girls’ doubles drew 280 students. Overall more than 400 students and a handful of teachers participated. Students were asked to pay a signup fee, which covered equipment and prizes; the remaining $3000 was donated to kids helping kids. A friend graciously donated tee-shirts for each competitor and many students began wearing matching outfits and crazy costumes for the events. The sport of pickleball has grown wildly in our area and we now compete annually against local Chartiers Valley HS. Kids are purchasing their own paddles and courts are being played on outside of the school day. Pickleball is an awesome lifetime activity and has become a major part of our PE program. Extra Note From Rocket: Upper St. Clair is a great example of a school giving their students the pickleball tools that will help them stay active for a lifetime. Great job Upper St. Clair! Oh, and real nice job on the fundraising! 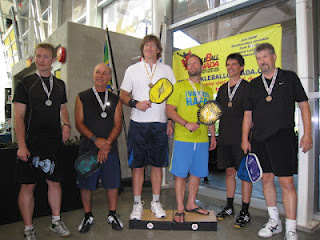 Pickleball Rocks!